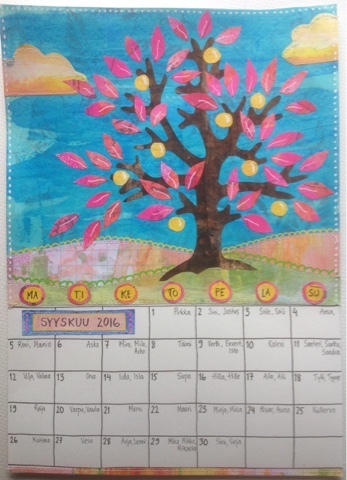 My third and last September take on the Craft Barn calendar challenge (brown and leaves) features an apple tree. 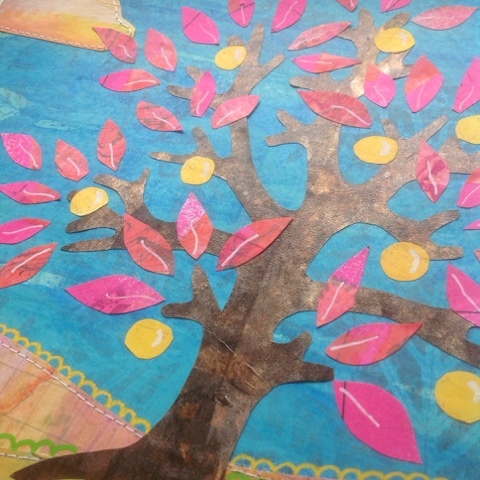 I am also posting for the September challenge (shades of autumn) at Our Creative Corner. To get myself in the mood I stamped the paper full of maple leaves and seeds, mostly covered up by the blue sky. I've tried not to do "real" colours on this calendar, so I kind of discussed the blue sky with myself, but decided that since it looks to be grey outdoors in reality, blue is fine. It demanded some strong colours to go with it, so I chose pink leaves and yellow apples (golden delicious tend to be greenish, so these are perhaps my favourite Finnish kind called "yellow cinnamon"). I find the ground a bit too boring, but didn't have stronger greens at hand. I cut out a tree for a calendar page last spring, and drew a template since it turned out quite nice. Now was the time to dig the template out and use it! Also some sewing and doodling on the page. I didn't do my normal step-by-step photos, because the evenings are getting dark, and taking decent pictures would have required special arrangements that would have disturbed the "doing" too much. 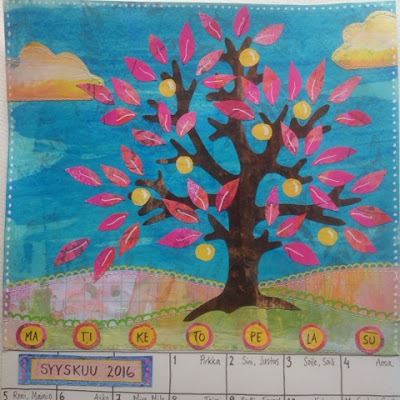 Kristiina, another fabulous page and so different from the others! Thank you for joining in The Calendar Challenge.